We manage our projects at a level that is required to ensure each is completed in a professional manner and with the highest standards of quality. The entire staff at Atlantic Wiring Group pushes hard to complete work on time and as promised. We are also eager to respond to our clients’ needs. We are willing to discuss problems and work them out fairly for everyone involved. Our bids are extremely competitive and the quality of work is exceptional. Melvin Lentz starting performing electrical work in 1987. During that time, he became very knowledgeable in the installation of building automation and control systems. 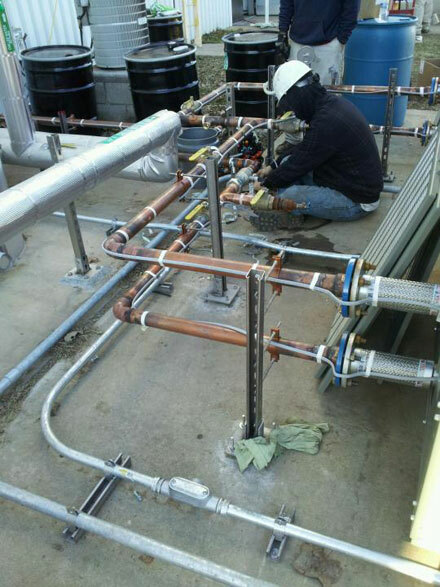 In 1998, Damuth Trane, an HVAC system provider and building services company in Chesapeake, Va., approached him about becoming a preferred vendor. The company was having a hard time finding qualified contractors to install their control systems. But Damuth Trane saw advantages to partnering with Melvin, due to their long-standing relationship and his deep knowledge of their building automation systems. They asked him to pull a team together, and as a result, he founded Atlantic Wiring Group in 1998. He currently holds a master electrician’s license. Dustin Rowe started in the electrical trade in 1991. He has been an electrical estimator since 1994 and a master electrician since 2000. He has performed and completed projects in excess of $3.5 million, most notably, Warhill High School in James City County. Dustin has also been an electrical instructor at New Horizons Education Center. He taught the following courses: AC Theory, National Electrical Code, Blueprint Reading, Grounding and Bonding, and Residential Wiring.